Mega-Bass 2020 – Teaser Performance from Icebreaker Audio on Vimeo. Look through that VHS fuzz, and listen as a Casio VL-Tone and synth go ultra-retro – they even play a cover of Jan Hammer. But that’s not what this story is about. This story is about using more simple grid techniques to create something that lets you improvise using your hands, to play music freely without looking at the screen. And Mega-Bass 2020, while still building on the grid ideas of monome et al, is a very sharp user-created marriage of software and hardware. With electric-pink and grape-on-gray retro graphics, the accompanying Reaktor patch is perfectly integrated with the hardware (the ubiquitous, inexpensive Novation Launchpad) to keep you focused on live performance. And it’s simple in a way that perhaps bigger commercial products wouldn’t be. It’s just kick, snare, pitch sequence, bass – building a simple framework that assumes the musician user will do the creative bits. 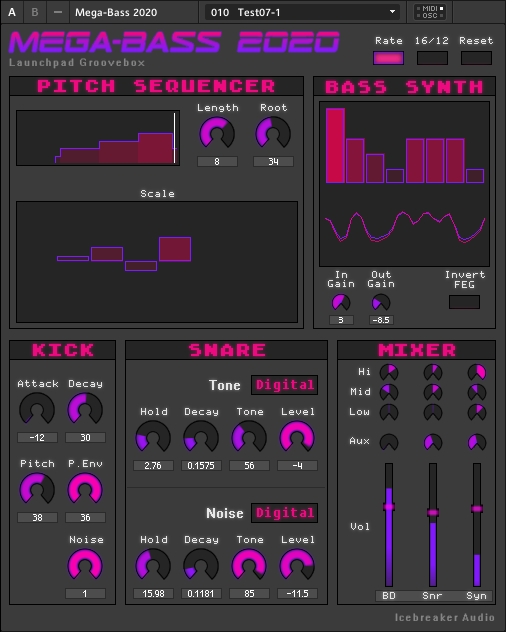 Mega-Bass 2020 is now out, following that faux-vintage VHS teaser, and and available as downloadable donationware. Mega-Bass 2020 – Tutorial from Icebreaker Audio on Vimeo. It’s built in Reaktor, so you can edit the underlying structure. And it communicates via MIDI, which means an enterprising user could adapt to something other than the Novation Launchpad – though the Launchpad remains a great bargain.